If you have never taken in the aroma of rosewater before you are missing out. It is simply heavenly! 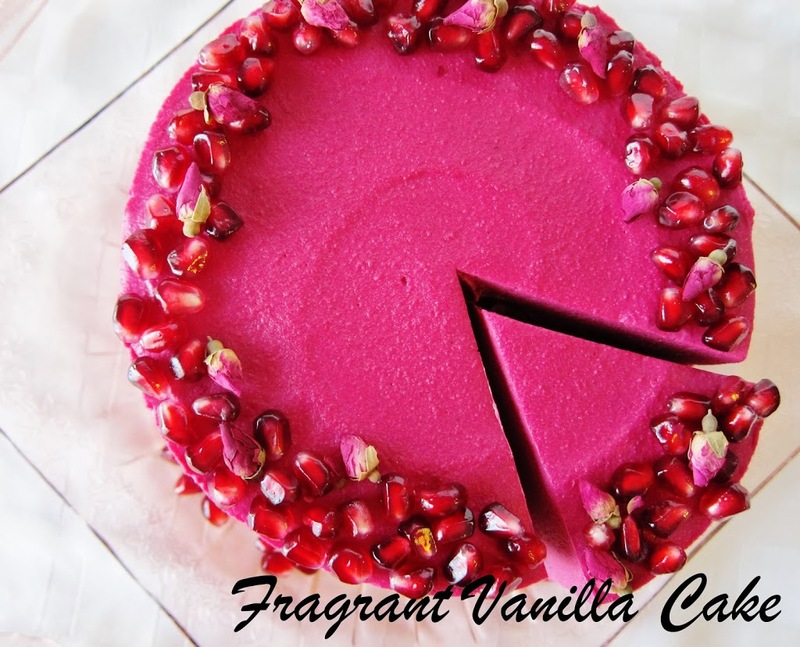 Last week, I had a craving for a dessert scented with this beautiful ingredient and I decided that I needed to figure out something seasonal to pair it with. 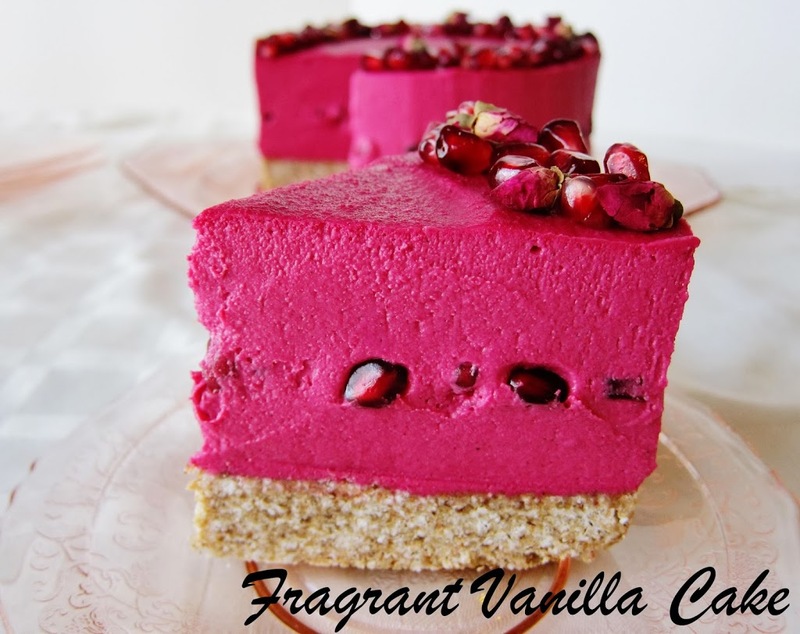 I love it with vanilla and berries especially in raw cheesecakes, but that is a bit summery...so I decided on pomegranate instead! Why not, the beautiful little ruby like pops of flavor would be wonderful with rose in a creamy cheesecake! 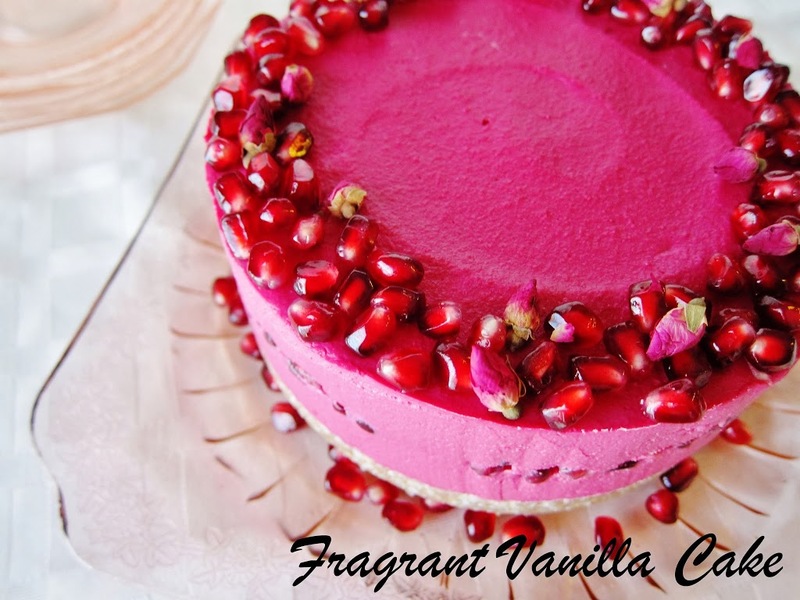 I imagined a pale pink tinted cake accented with bright red pomegranate arils, but it ended up a little different than that. I was making my usual coconut base for a cheesecake, but I did not quite have enough coconut meat. No worries though, since I am resourceful I substituted red beet for one of the cups of coconut. I was going to use about 1 Tbsp of beet originally just to color the cake to make it a light pink color, but the cup of beet made it the most beautiful deep pink color! You could not taste the beet, and there is nothing wrong with getting a little extra veggies in even if it is dessert so it was a win all around. 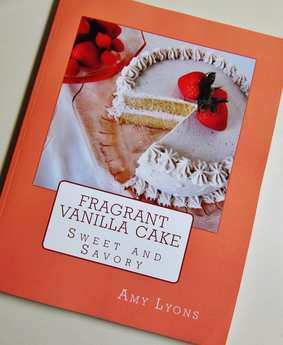 The filling tasted amazing, like light vanilla and rose. Something you have to close your eyes and take in the scent before tasting because it smelled wonderful as well. 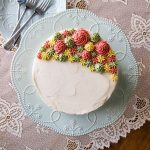 I poured it atop a crunchy cardamom scented crust, added a layer of tart pomegranate seeds in the middle and topped off the cake with them as well, and I knew this was going to be good. The thing is it was not just good. I think most things I make are good, but this was crave worthy deliciousness! A feast for the senses, almost too pretty to eat but I never let that stop me. Lightly coat a 6 inch spring form removable bottom pans with coconut oil. 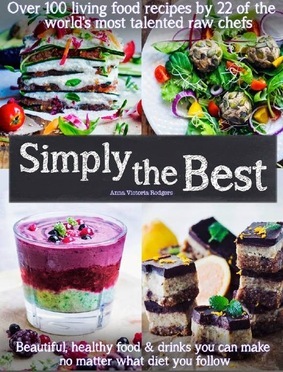 To prepare the crust, process buckwheat, coconut and sea salt in a food processor until it is fine crumbs, then add the dates and process until the mixture holds together when squeezed between your fingers (if not holding together, add more dates). Firmly press crust into the bottom of the prepared pan, and set aside. 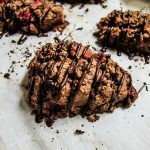 To make the filling, in a food processor combine coconut, beet, coconut water, coconut nectar, sea salt vanilla, rose, and blend until smooth and creamy. With the processor running, add the coconut butter, and process for a minute until blended. 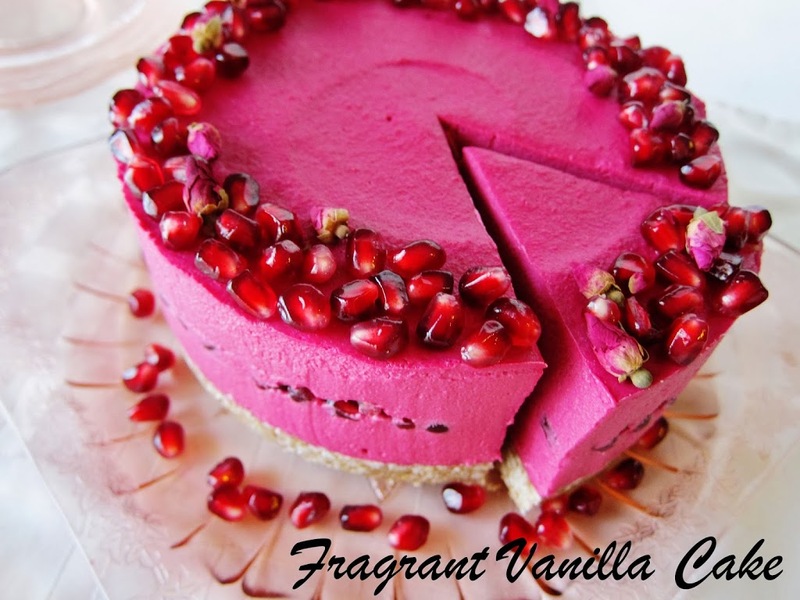 To assemble cheesecake, pour half the filling over the crust, then sprinkle with a cup of the pomegranate seeds. Pour over the remaining filling then place the cheesecake in the freezer to firm up for about 4 hours until set before unmolding. 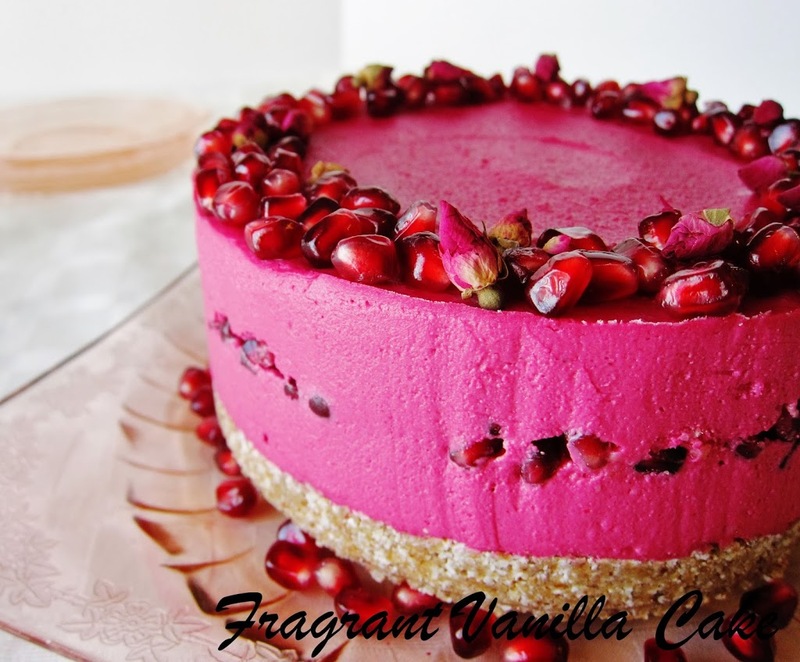 Garnish the top of the cake with the remaining pomegranate seeds around the top and bottom of the cake on the plate. Scatter a few dried roses around it as well. Store cake in the fridge. *If you do not have access to young coconut meat, you can substitute 3 cups raw cashews soaked for 4 hours and drained for the coconut and filtered water for the coconut water. Thank you :)! I did not realize that! How appropriate that I made it this color then :)! Oh...you have to try rosewater, you will love it, and I am sure you can come up with something really delicious too! Butter, but oil can be used if you do not have butter. It should, but I would not add too much or it will be too firm. Awesome :)! Thank you for letting me know, I am so glad you tried it out! You are so welcome! So happy you were inspired even if it turned into something else ;). Yours is lovely! You are so welcome :)! I am happy you made the cake and enjoyed it! Thank you so much for letting me know! No, it does not taste beety. I used very fresh local beets though, and they were sweet.